Australian pharmacists use GuildCare Programs to enhance the quality of medical care they provide patients, improve the general health of the community, build their pharmacy practice and comply with the recording and reporting requirements for the 6th Community Pharmacy Agreement (6CPA) Pharmacy Practice Incentives and Medication Management. 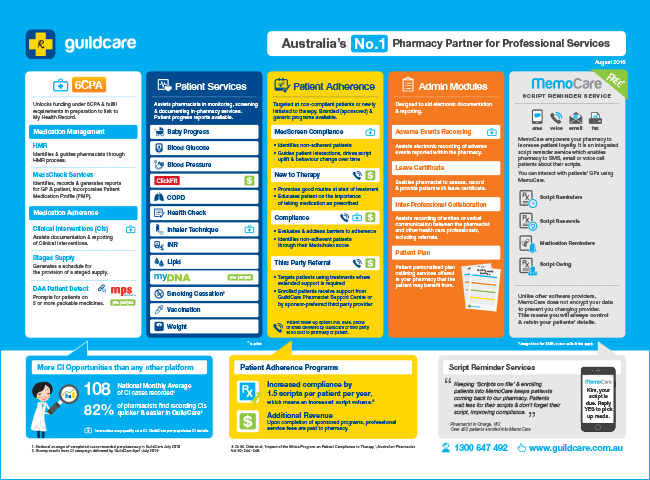 GuildCare Programs consist of five program streams that enable Australian pharmacies to deliver professional services to their patients. As GuildCare programs integrate with ALL major dispensing software, pharmacists spend less time searching and retyping patient information, and can focus on delivering services. 6CPA Pharmacy Practice Incentives and 6CPA Medication Management - Programs designed to unlock funding under the 6CPA and fulfil requirements in preparation of creating a link to the Personally Controlled Electronic Health Record (PCEHR). Patient Services - Assist pharmacists in monitoring, screening and documenting in-pharmacy services. Enables change, providing positive health outcomes in patients. Pharmacists can use their own business model for these services. Patient progress reports are also available. Patient Adherence Programs - Sponsored programs targeted at patients that are non-compliant or newly initiated to therapy. Admin Module - Electronically documents Adverse Events presented within the pharmacy, provides patient with a professional services plan, and records patient leave requests and supplies certificate. Download GuildCare Programs overview document or watch our GuildCare Overview Video demonstrating how the software enables pharmacy to unlock 6CPA funding. For many years, Pharmacists have monitored patient conditions such as measuring blood pressure. These services have been recorded in a variety of ways, including patient cards and spread sheets. GuildCare recognises that while these services are provided in the pharmacy on a regular basis, there is a requirement for standardising service delivery by streamlining and simplifying the process. GuildCare guides the pharmacist to record and monitor patient's progress and provides the patient with a handout in a structured professional format. The handout contains the patient's name, pharmacy details and patient results as a one off measurement or as a series of measurements monitored over time. The report may include comments or observations associated with each record at each point in time. This allows the patient to easily share information with their doctor. 'Pop up' in program alerts the pharmacist to patients who may qualify for the service. Patient Adherence Programs involve a partnership with pharmaceutical companies to develop programs that enhance the level of medical care pharmacists can offer patients who have been prescribed specific drugs. Whilst the content for GuildCare Patient Adherence Programs is evolving, the basic benefits of the Patient Adherence Programs software remain the same. They include strategies to encourage patient compliance, provision of patient friendly information to support their medications and advice on lifestyle programs that can complement their treatment. Pharmacists may be eligible to receive professional service fees from the relevant pharmaceutical companies.